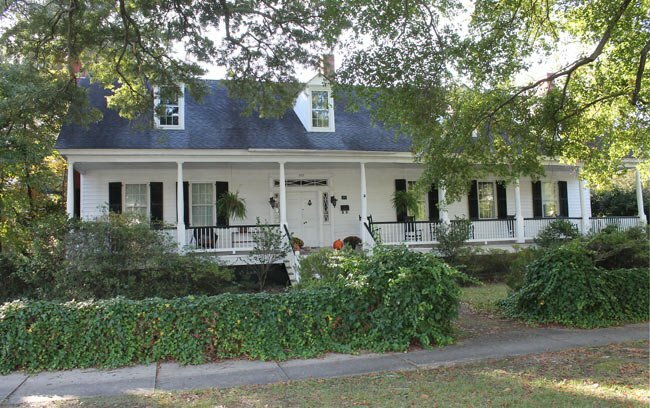 This historic home in Cheraw, known as Boxwood Hall, was built around 1822 by Dr. Thomas Ellerbe Powe for his bride, Charlotte. As is the case with many homes in the town’s historic district, there is a Civil War story to be told regarding this unassuming residence. During General Sherman’s occupation of Cheraw in 1865, the town was under much duress. The Union general had made his headquarters at neighboring Hartzell House, and the streets of Cheraw were blanketed with cannon fire during his stay. According to local legend, a cannon struck the floor of the porch at Boxwood Hall and damaged the porch railing. The family living in the house hid food out of fear of being pillaged by the Union troops, and a ham was placed in the attic. To this day a grease stain is visible in the ceiling where the ham was said to have been hidden. SCIWAY thanks David Sides, Cheraw Director of Tourism and Community Development, for sharing the above photo and the story. Around 1736 Welsh Baptists came to South Carolina and settled in the Pee Dee region. In 1766 Eli Kershaw, who had been given a grant of land along the Pee Dee River, laid out the town of Cheraw. It was incorporated in 1820. Located at a key navigational point, Cheraw began to develop as a commercial center of interior South Carolina; however, the Civil War and Reconstruction temporarily halted this progress. For a time development was impeded and rebuilding was delayed. Although the town eventually prospered, much of its physical character remained unaltered. The town of Cheraw also played an important role in South Carolina military history. During both the American Revolution and the Civil War, British and Union troops used St. David’s Episcopal Church as a hospital. The meeting house style church still stands today. Additionally in 1825, Revolutionary War figure Marquis de Lafayette stayed in Cheraw during his tour of the United States. Located within the district are a variety of architectural styles that include the early frame homes of the 1800s (often called upcountry farmhouses, or essentially I-House in type), antebellum structures with Classical Revival details and Greek Revival porticos, and Victorian houses from the turn of the century. The district also includes several churches, a cemetery, and the towns’ original boundary markers dating from 1766. Beautiful write up and thank you so much for it. The picture is also very pretty. I am from Cheraw and have been friends with a family that lived there. They were quick to show me the grease stains when I found it hard to believe about the ham and grease stains.